Offering real-time data replication services to deliver data from on-premise data centers to the Oracle Cloud. Perhaps the most obvious application of this Oracle GoldenGate Cloud Service is the ability to move mission-critical applications to the cloud without interruption, which is clearly beneficial for systems that cannot tolerate downtime. But there is a lot more to this service than simply migrating existing on-premise systems to the Cloud. I will walk you through some of the highlights and benefits that make this product an absolute must for your growing business and enterprise needs. 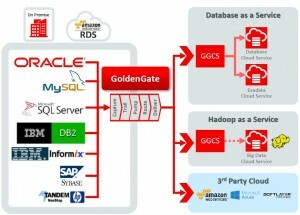 The Oracle GoldenGate Cloud Service supports many of the same source systems that Oracle GoldenGate (the on-premise version) supports, such as Oracle, MySQL, Microsoft DB2 and the old standard, Tandem. But perhaps the most important compatibility is with Amazon Webservices RDS (see the diagram below). Hopefully, for Oracle’s sake, this will stop the “all roads lead to AWS” train that’s been rolling for the last few years – well, maybe it’s been rolling for the better part of a decade. Needless to say, Oracle absolutely must compete in this space and this is a huge step toward doing so. Let’s take a quick look at some of the things that customers (and GoldenGate techies alike) gain from this incredibly powerful tool. It’s Non-intrusive. As a practicing GoldenGate consultant with nearly 10 years of experience, I can’t tell you how many times I’ve had a DBA tell me that the capture process (better known as extract) dramatically impacts source database performance. Without going into too much detail here, let me be 100% clear. The bottom line is that on a correctly tuned database with a properly configured GoldenGate configuration, the product is absolutely non-intrusive – and that’s what we love most about it! It Supports Heterogeneous Replication. Whether its Sybase to Oracle, DB2 to Oracle or even MySQL to Oracle, this service can handle it! Equally important to remember, just because both the source and target are Oracle databases, does not mean the replication is homogeneous. One could be a version 10.2.0.4 on IBM AIX and one could be 11.2.0.4 or 12c on Linux – and these are considered heterogeneous for replication purposes. It’s Resilient. The underlying design of the GoldenGate processes make them extremely fault-tolerant. We’ve had DBAs accidentally kill GoldenGate processes hours away from a migration (or cut-over) without impacting the planned timeline. It’s Commitment to Data Integrity. Data Integrity is guaranteed! This comes with perhaps the biggest disclaimer I’ve given online. Data Integrity can only be guaranteed if the product, in this case Oracle GoldenGate Cloud Service, is deployed by an expert i.e. someone that knows how to configure and prepare the source and target environments for success, and someone that is experienced in assessing and addressing any issues that may arise from testing BEFORE moving to production. The experts at Nugravity can help you Get GoldenGate Right. Finally, let’s review a few of the Use Cases for this new Oracle GoldenGate Cloud Service offering. Migrate to Oracle Cloud without Business Interruption. This has been covered fairly thoroughly in my earlier thoughts, but I do want to mention, one more time, that Oracle GoldenGate Cloud Service makes it possible to not only migrate existing on-premise solutions to the cloud. This service also gives you the ability (and opportunity) to move away from AWS solutions and onto the Red Stack, or augment your infrastructure to work with AWS. Real-Time Data Warehouse & Analytics. Perhaps you are looking to offload your DW & Analytics to the Oracle Cloud. Oracle GoldenGate Cloud Service gives you the ability to do so and supply your business processing engines with Real-Time data at the same time, all with one product. Specifically, it helps you to reduce your operating costs while increasing analytical capabilities – sounds like a win-win! Support Growth and Enterprise Expansion. Some of the biggest challenges in today’s complex business landscape have to do with supporting corporate growth including by M&A (Mergers & Acquisitions). The heterogeneous capabilities of Oracle GoldenGate Cloud Service make many of these problems as simple as signing up. Oracle GoldenGate Cloud Service is great tool to that can help you make the move to the Cloud and give you the freedom to truly realize the potential of your Enterprise Data. By bridging the gap between On-Premise database assets and Cloud-based assets, you can make the transition at your own pace, or move only the components you want to the Cloud without severing the lifeline between dependent data systems.